The Green Mandarin fragrance surrounds the body with the freshness of Mediterranean citrus fruits. Sunlight is expressed through the harmony of the precious citrus essences, which refresh the skin and revitalize the spirit. Notes for the spicy citrus wood fragrance include orange, neroli, mandarin, lemon, rosemary, mint, jasmine, rose, ylang ylang, eucalyptus, petitgrain, cloves, pepper, patchouli and musk. 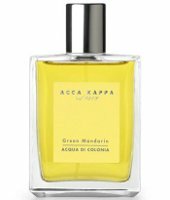 Acca Kappa Green Mandarin is available in 100 ml Acqua di Colonia. I like this brand too…wish I could find them nearby, would love to get some more soaps but I’m too cheap to spend shipping $ on them! My favourite online soap shop carries Acca Kappa and I was sent a sample of this with my last order. I really really really like it. Though I find it more of a straight forward citrus than those notes would suggest – I am dabbing out of a sample vial though. It’s very real smelling – no cleaning product or lolly or fizzy drink associations at all. The green mandarine is nicely bitter. I’m actually thinking of buying a bottle as I’ve drained the sample in record time. I doubt it’s brilliant or original (I’ve haven’t sniffed much in the way of citrus fragrances) but I find it a pleasurable easy wearing hot weather scent. On an aside one of the soaps I bought was Nesti Dante’s Detox: Winter Daphne, White Lotus and Echinacea in the hope it would smell even a little like daphne. But no luck. My search for something that captures the scent of that extraordinary flower continues….. I was curious to try this looking at the list of notes so I put the last few drops on my wrist and I definitely don’t get any cloves, pepper or patchouli. The base to my nose is a short lived citrusy musk. And the florals are not really obvious. All I get is the citrus – predominately bitter mandarine and the herbs… Nothing earthy spicy or woody here at all…..
EDIT: the scent I sampled was actually the Acca Kappa Green Mandarin Replenishing Body Water (I emailed the place I got it from, not that that was clear on the sample – it just said Green Mandarin) SO that explains why so many of the notes were indetectable….. Ha! But now I really want to smell this because that green mandarin note really is lovely!! Ah, thanks for the report! Lizziemarian — I think Daphne is what was blooming around me earlier in March and you are so right, what an amazing aroma. If you ever find a fragrance that captures it, I hope you’ll let us all know!